An intense, deep blue sea surrounds the volcanic archipelago of Northern Sicily, best known for its stunning coastline as well as for the unique landscapes it offers. The name of the archipelago comes from the Greek god of winds, Aeolus. Seven islands, two active volcanoes and steaming fumaroles on almost every island, and a history that starts even before the 4th Century BC: an authentic Mediterranean atmosphere pervades the islands, and a unique typical architecture can be found in the whole archipelago (small cubic white houses with tiny terraces and columns, as well as amphoras on the roof to collect rain water), yet every single one has its own peculiarities and distinctive features. In our villas on the Aeolian islands catalogue you will find the holiday homes we picked on the largest islands of the archipelago, Lipari and Salina. If you are looking for more estates take a look to our complete holiday rentals in Sicily selection. Alicudi, the westernmost island, is actually the top part of the long-extinct Montagnola volcano: its coastline is steep and irregular, and its name comes from the Greek word for “Erica”, heather, still growing on the slopes of the island. The village counts less than 100 inhabitants and just one restaurant serving the day’s catch, but the island’s soil is so fertile that olives, grapes and capers are still the main economic resource today, together with tourism. Filicudi is the second westernmost island after Alicudi. Its name also derives from the ancient Greek language: “Phoinix” meant “Mediterranean dwarf palm” that still grows all over the island. The ancient human presence in the island is proved by the remains of a Neolithic village on the headlands of Capo Graziano; stunning landscapes, as well as beautiful panoramas, can be observed from all over the island – we recommend a visit to the Bue Marino cave and the Giafante rock, a very small island that originated from a volcanic eruption and whose shape reminds of that of an elefant. Lipari is the largest and most populated island, and the centre of the whole archipelago. Shaped through time by 12 different volcanoes, its volcanic nature can be easily perceived in its red rocks and the vast pumice flow in the North-Eastern area, as well as in the three ancient obsidian flows. Nature is beautiful and varied; bougainvillea grows in the tiny gardens of the pretty white houses of the little town, overawed by the castle, built upon a volcanic rock overhanging the Tyrrhenian sea on a former Neolithic settlement. Nowadays, a very interesting Aeolian Museum occupies some of the buildings of the fortress: the Museum houses a wide range of remains and evidence, some of which really ancient, distributed over more than 40 rooms. Diving lovers will find that the seabed surrounding the island is a true paradise, with a varied and unique underwater landscape, flora and fauna, as well as interesting traces of the history of the island. The island is actually the visible part of a huge volcanic system, which is still considered as active nowadays; however, the only volcanic activities recorded lately are related to its thermal springs and fumaroles. 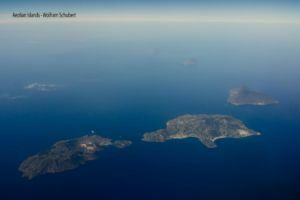 Panarea is the tiniest island of the archipelago and the most ancient one; its splendid nature and deep blue sea have made it the most famous Sicilian Island among the VIPs, together with Pantelleria. A glamorous site rich in pretty white houses with blue doors, as well as charming bays, cliffs and highlands, and a perfect destination for summer holidays. The most ancient remains on the island include a village set on Punta Milazzese dating back to the Bronze Age. One of the most popular activities in the island is scuba diving, and even a shipwreck can be reached by swimming between two of the many offshore rocks surrounding Panarea. Salina is the second of the Aeolian Islands for its extension as well as for the number of its inhabitants. Its “Fossa Delle Felci” is the tallest mountain of the whole archipelago, actually an inactive volcano; its name originates from a little lake from which salt was once extracted. The island is the most fertile and productive: the flavoursome grapes used for the production of the worldwide-known sweet wine “Malvasia” find here the perfect soil for a flourishing growth. Stromboli is actually the visible part of an active volcano – actually one of the most active volcanoes worldwide. As always, the volcanic origin of the island make the soil particularly fertile and productive: grapes, olive trees and figs have been cultivated here since ancient times. This island is the perfect destination for tourists looking for peace and quiet, together with authentic and unspoilt landscapes. Vulcano is the southernmost island of the archipelago, and it originated from the fusion of various volcanoes, one of which (despite the absence of any eruption since the Nineteenth Century) is still to be considered active. fumaroles are an evidence of its activity: their healing properties are still widely appreciated nowadays. A curiosity: according to the American writer Richard Paul Roe, this island is the setting of “The Tempest”, William Shakespeare’s masterpiece.